Breeze Block Gallery Portland OR. For the month of November, Breeze Block Gallery is very proud to present Three The Hard Way; a three-person exhibition featuring Augustine Kofie, Jerry Joker Inscoe and Christopher Derek Bruno. All three artists come from a graffiti background, and are firmly established members of the pioneering Transcend graffiti collective. These highly versatile artists are equally known for their large-scale mural projects, as well as their own very individual voices in a gallery setting. Traditional letterforms are abstracted into geometric configurations within their work; and dimension, form and space are considered and explored within their dynamic compositions. Their collective approach to art-making is steeped in academic discourse, and whilst retaining the vibrancy of their graffiti backgrounds, traditional art movements such as Futurism, Abstract Expressionism and Precisionism are also embraced by the visual vocabulary imbued within their work. The exhibition title itself is a literal reference to the historical terminology Hard-Edge painting; which was first coined in the late fifties and used to describe intense and abrupt delineation of color within the burgeoning Geometric Abstraction and Op-art movements. Whilst these artists acknowledge and embrace movements of the past, they confidently stand outside of historical classification and have established themselves as a core group of protagonists defining a contemporary movement they have made their own. Whilst the three artists have shown together previously in larger group exhibitions, Three The Hard Way is the first time that this trifecta has shown together in a collaborative environment. For the month of November the three artists will take over both of Breeze Block’s gallery spaces for an installation that incorporates the full range of multi-facetted oeuvres from each of these influential creators. 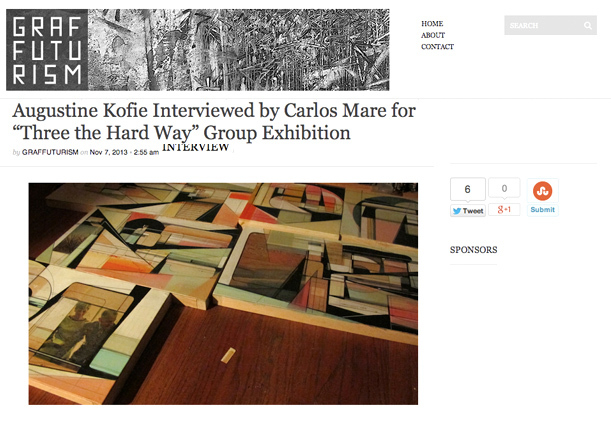 Continue on..
A recent interview posted on GRAFFUTURISM conducted by Carlos MARE 139 discussing my partisipation in the Three The Hard Way exhibition at Breeze Block Gallery, Protland. A pretty through interview covering interesting points, including my recent show ‘Structurally Sound’ at White Walls, SF. 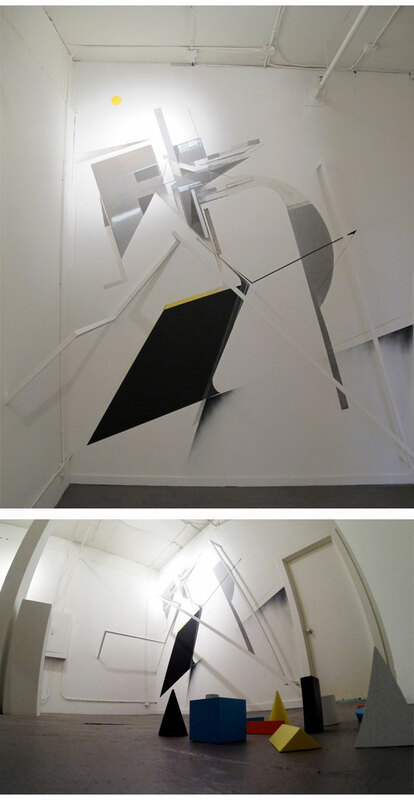 Many thanks to Graffuturism, Carlos MARE 139 and Sven Davis. Group Exhibition: CUATRO IGUAL A UNO @ Celaya Bros. Gallery, Mexico D.F. Solo Exhibiton: OFF/GRID at David Bloch Gallery, Marrakech, Morocco.